Published October 3, 2017 Filed under USN Columnists, Utah. Total of 1 comment in the discussion. John Curtis, Republican candidate for the third Congressional District appears to be an ethically challenged flip-flopper. He, therefore, has what it takes to successfully be a full member of the Washington D.C. swamp. Like ethically challenged Washington swamp dwellers, Curtis is willing to do and say whatever is necessary to get elected for his own personal gratification and aggrandizement rather than to serve the people who elect him. 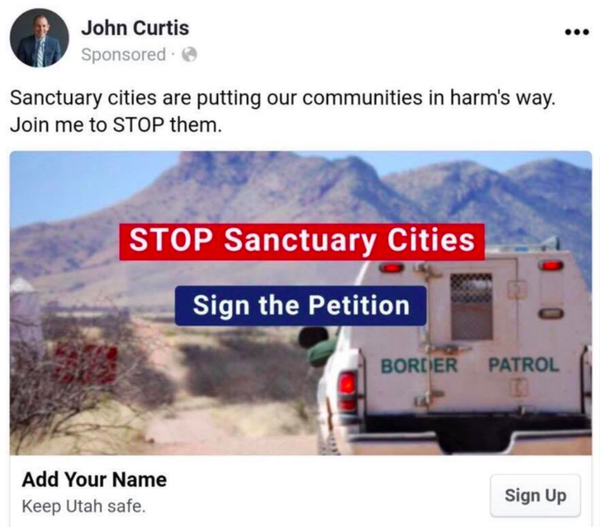 Most recently, Curtis sponsored a Facebook ad that stated unequivocally that “Sanctuary cities are putting our communities in harm’s way” which was consistent with what he said when he was running for the Republican Party nomination. 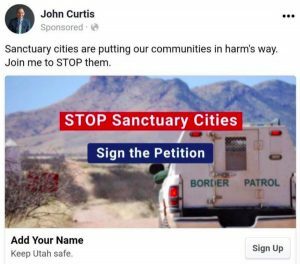 However, Curtis quickly reversed course when his Democrat opponent accused him of opposing sanctuary cities. So, now it looks like Curtis was against sanctuary cities before he was for them. But it’s even more complicated than that. In February 2017, when Provo’s police chief reminded his officers that their role is not to forcefully detain illegal immigrants or act as Immigration and Customs Enforcement agents, Curtis had no problem with the chief making Provo a de-facto sanctuary city. A short-time later, when the police chief was forced to resign because of sexual assault allegations, Curtis praised him by noting that “One of his really strong points has been a really strong outreach to the community, especially our minority community.” So, Curtis was actually for sanctuary cities before he was against them before he was once again for them. 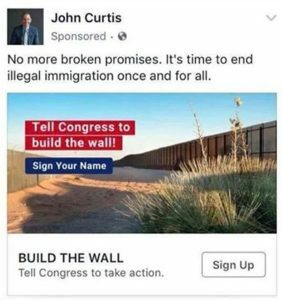 When it comes to the construction of a wall, Curtis was for it before he was against it. 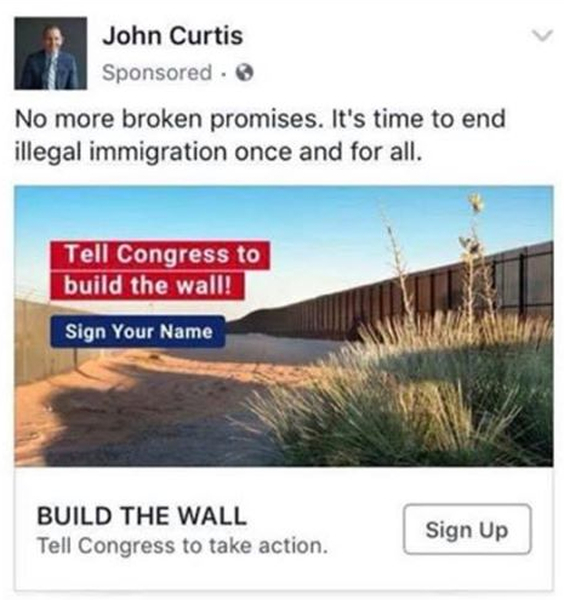 Curtis sponsored a Facebook ad calling for the construction of a wall to stop illegal immigration and then immediately said that he didn’t really mean it. When it comes to party politics, Curtis was a Republican before he was a Democrat before he was a Republican. He ran unsuccessfully for office as a Democrat and proudly notes that he didn’t vote for Donald Trump. In the past, he said that one-party dominance (house, senate, executive) is a problem thereby raising the question of why he would run as a Republican in order to maintain Republican dominance at the national level. In spite of Curtis’ checkered past, Utah will be almost certainly be sending this Republican in name only (RINO) swamp dweller to Congress because Utahns in the 3rd Congressional district won’t elect the Democrat candidate, Dr. Kathie Allen who, unlike Curtis is not afraid to say that she is a Democrat and to stake out and stick to clearly defined positions on sanctuary cities, the wall and opposition to President Trump. Democrats and other progressives have two choices—either vote for a true-blue sanctuary city Democrat who likely cannot win or vote for flip-flopper John Curtis who is really a Democrat without the conviction of his ideas but who can win as a Republican. Republicans, on the other hand, are left without a candidate. If they stick with their party, they will have to vote for an ethically challenged RINO who will very likely be the consummate swamp dweller. If they decide to break with their party, they will have to either vote for the Democrat or vote for a third party or independent candidate. Given the choices available and the distance between the Democrats and the electorate in the third Congressional District, the smart money is on the flip-flopping RINO.